Silberra LITH-9 is a classic photo paper developer for lith printing. Lith printing is based on the effect of infectious development, and lith developers are technical "tropical" developers used not on purpose and with the violation of the model rules. Potassium metabisulfite, hydroquinone, potassium bromide, sodium hydroxide. A working solution is prepared by pouring the contents of the packs into water while continuously stirring the solution (use glass stick or special plastic stirring stick for chemicals). Distilled or filtered water is strongly recommended. 1) Warm 500 ml of distilled water up to 50-52 Celcium degrees. 3) Add distilled water of room temperature (20-22 Celsium degrees) to make up to 1 litre and stir, then allow the solution to cool to room temperature. 4) Dissolve contents of pack #2 in the second volume (1 litre) of distilled water of room temperature. 5) As soon as both solutions are ready (when all reagents are totally dissolved), pour solution #2 into solution #1 while constantly stirring. Dilute the resulting concentrate with distilled water to a ratio of 1+14 to obtain a working solution. Solutions #1 and #2 can be stored separately, without mixing - in this case you should mix the volume you need for the working solution immediately before use and then dilute the mix with distilled water to a ratio of 1+14. Silberra LITH-9 Developer working solution works with all photo emulsions. Development time of lith printing can not be predicted. Infectious development passes at temperature of 21-22 Celsium degrees and may take from 15 to 40 minutes before first black dot appears. 1 litre of Silberra LITH-9 Developer working solution can be used to process 1-2 photo paper sheets in format not exceeding 24х30 cm or 3-4 photo paper sheets in format not exceeding 18х24 cm. Lith developers don't usually have side effects. Please note that contents of pack #2 is a caustic alkali, and it is necessary to handle and store it with caution: always use special gloves and utensils that are resistant to active chemical compounds. Keep Silberra LITH-9 Developer in a cool, dry and dark place. Keep away from the children. It is optimal to store your working solution in opaque, chemically inert and tightly sealed containers with minimal air space in order to reduce oxidation.When storing solutions separately, it is necessary to store solution #2 in a special container or in a tightly sealed dark glass jar. 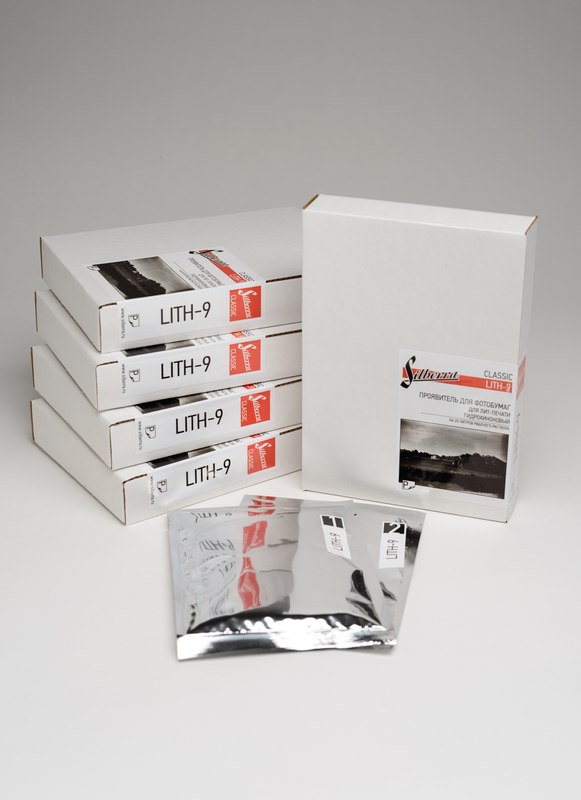 Sealed Silberra LITH-9 powder packs can be stored up to 24 months past the production date; concentrated LITH-9 can be stored in tightly sealed bottles for up to 12 months past the production date. 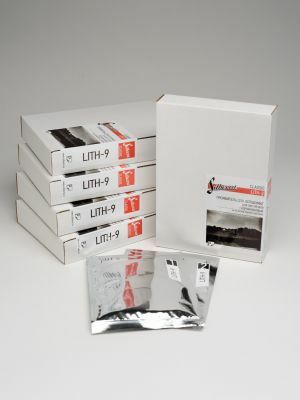 Unused Silberra LITH-9 Developer working solution can be stored in a sealed bottle not less then 6 months. The used working solution can't be stored. Silberra developers and fixers must be disposed in accordance with the rules and regulations of the country they are used in. Concentrated developers could be toxic and may harm the environment unless disposed in appropriate manner. Silberra recommends to use special disposal services provided by correspondingly licensed organizations which are eligible for photographic chemistry recycling/disposal.